JL Youth is our programme of arts opportunities for young people working to raise confidence and aspirations, and combat inactivity and isolation. We have been fortunate to secure investment and funding that allows us to deliver projects for free to young people across Haringey, Barnet and in other areas of North London. 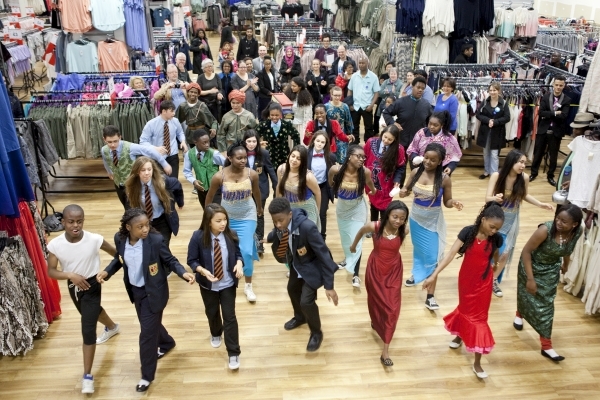 One Night Only - an immersive heritage and performance project in a shop in Wood Green. Created with artist Kazuko Hohki and students from St Thomas More School, Wood Green. Our projects include JL Circus which offers weekly circus and theatre sessions to young people in Haringey and Barnet out of school hours. We also have our careers and skills development programme LAUNCH which includes our Youth Board and National Theatre Connections project and our new Heritage Lottery funded programme in partnership with Keats House OMG Keats! We have schools workshops on offer (Join the Circus and LAUNCH) as well as being an Arts Award Supporter and Arts Award Centre. Have a look at the projects sidebar to see the projects in more detail and don’t forget to engage with us on Facebook and Twitter.